I have become a serious home-made bread addict. 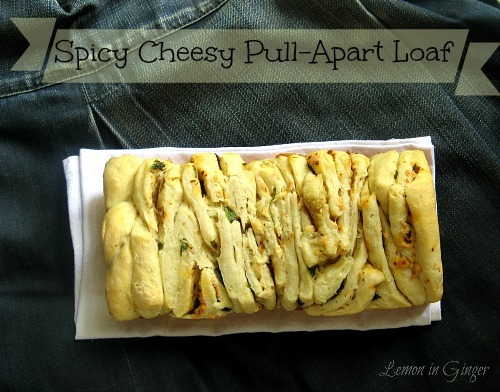 I am always on the prowl for simple and doable bread recipes. When I contacted Aparna for joining her We Knead to Bake bread group, she told me, she has closed the entries. I was disappointed but decided to try few recipes which appealed to me from her collection. What I like about Aparna’s recipes and post is that she is very detailed and if you go through the post completely, there are hardly any chances of going wrong. I kept the recipe almost what she has suggested and made some minor changes. I found the occasion for baking this scrumptious loaf on our friend’s birthday. Yes, for whom I baked this Eggless Cherry Choco Marble Cake. 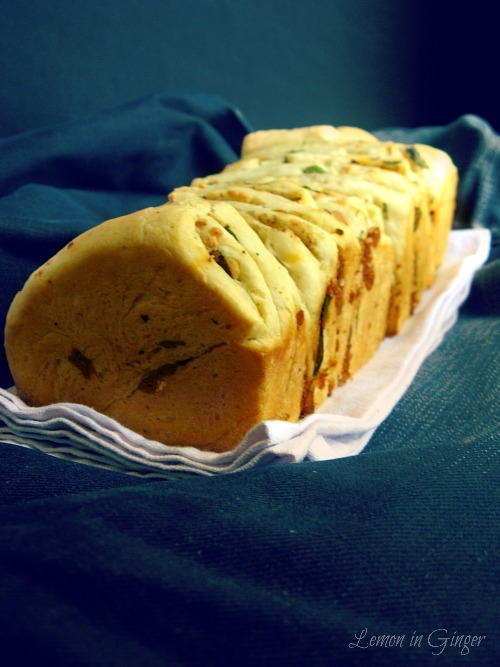 Her son had loved my earlier Eggless Herb Pull-Apart Rolls. I knew nothing pleases a mom more than seeing her child eat home-made goodies! So I gifted her this bread on her birthday. It’s a completely separate issue that I had to bake multiple other breads to placate V.
He still can’t get over the fact that sometimes I would make things and he won’t get a bite. 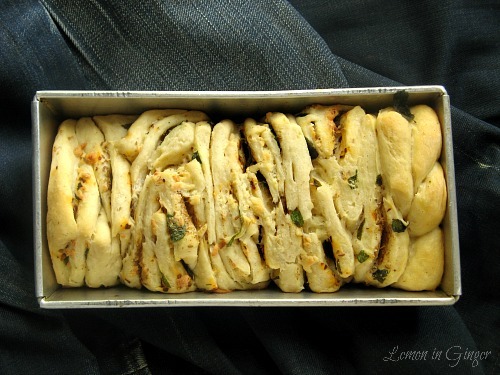 An easy and scrumptious Pull-Apart Mint Loaf. In a small bowl, mix together sugar, yeast and warm milk. Keep aside for 5 - 10 minutes till the mixture becomes bubbly and frothy. In a large bowl, place flour, softened butter, salt and ginger paste. Mix well. Add the yeast mixture and remaining milk. Knead well till you have a soft, smooth and pliable dough. The dough shouldn't be sticky. Add very little flour if the dough is sticky. Shape the dough into a ball and place it in a well oiled bowl, turning the dough around to coat completely in oil. Cover and let it rise in a warm and dry place for 1 to 1 1/2 hours until almost double. Dust the work counter with flour, deflate the dough, shape into a square and roll into a larger squarer about 12 X 12 inches. Brush the surface of the square with melted butter. Spread the filling - cumin seeds, chili flakes and mint leaves. Finally spread the grated cheese on top. Using a rolling pin, gently press down the filling so it doesn't fall off when stacking the strips. 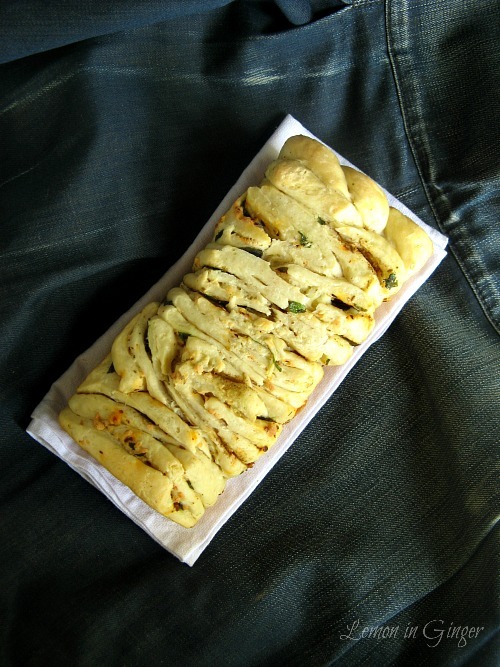 Using a pizza cutter or sharp knife, slice the rolled dough into 6 long even strips. It's ok if they are not perfect. Lay each strip on top of the other with topping facing upwards to get a stack of strips. You can place the 2 strips from the side in the middle of the stack so that it appears neater. Using a pizza cutter or a sharp knife, cut down through the stack of strips dividing it into 6 equal smaller stacks. Grease a loaf tin, I used a 8 1/2 X 4 1/2 inch tin. Lightly flour it. Place the cut squares into the prepared pan, cut side down, stacking against each other. Cover the pan with a kitchen towel and allow to rise for an hour. Pre-heat oven to 180 C. Lightly brush some milk over the top of the loaf. Bake for 40-45 minutes till it is done and the top is golden brown. You can vary filling as you desire. sweet, savory, raisins, garlic, caramelized onions. Get creative with it. If using sweet filling, increase sugar to 1/4 cup and remove whatever other filling you want - ginger, cumin seeds, cheese, etc. Copyright, 2015 Lemon in Ginger. All Rights Reserved. Bake Fest # 24 hosted by Pallavi, an event originally started by Vardhini. What’s with my Cuppa event started by Nupur. Panissimo – October Edition, originally started by Bread & Companatico (Barbara) and Indovina chi viene a cena? (Sandra).